This deluxe double CD set is the third release in a brand new series of re-issues of the legendary Cilla Black’s original albums. 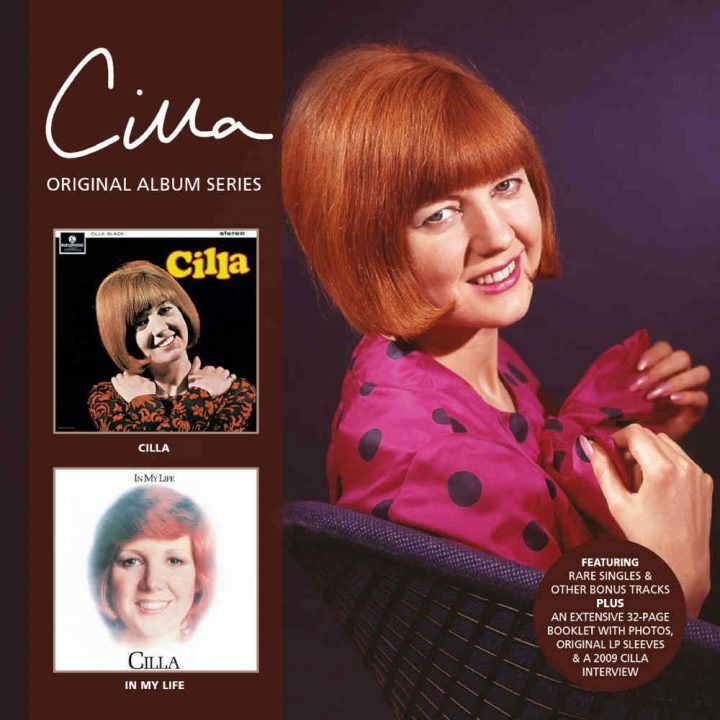 In this package, Cilla’s ‘Top 5’ hit debut album from 1965, “CILLA”, featuring a wide array of song material and musical styles, is paired with her 1974 soft rock album “IN MY LIFE”, which is released for the very first time on CD. This deluxe double CD set is the third release in a brand new series of re-issues of the legendary Cilla Black’s original albums. In this package, Cilla’s ‘Top 5’ hit debut album from 1965, “CILLA”, featuring a wide array of song material and musical styles, is paired with her 1974 soft rock album “IN MY LIFE”, which is released for the very first time on CD. Both albums contain a wealth of bonus tracks; in fact, there are 26 bonus tracks in total across the package, including the whole of the “Cilla” album in its variant mono version. This release, along with all the others in this Cilla Original Album Series is endorsed by its Executive Producer, Cilla’s son Robert Willis and comes with a 32 page booklet including extracts from a 2009 interview with Cilla, introductory essays about both albums and contemporaneous photographs from both the record company archives and the Cilla Black Estate. Disc One contains her debut album “Cilla” which showcases her diverse vocal range through an array of jazz, pop and soul tunes. These include Cole Porter’s standard ‘You’d Be So Nice To Come Home To’, Marvin Gaye & Mickey Williamson’s soul classic ‘Dancing In The Street’ and Burt Bacharach & Hal David’s pop hit ‘Baby It’s You’. Additionally, there are the power ballads, ‘One Little Voice’ and ‘Come To Me’, the second of which was written especially by George Martin and Cilla’s future husband Bobby Willis. The album peaked at # 5 during an 11 week run on the UK album chart. This re-release notably includes amongst its bonus tracks ‘(Love Is Like A) Heatwave’, a session outtake originally only included in the repackaged US edition of this album, as well as ‘A Shot Of Rhythm And Blues’ from Cilla’s first ever recording session at Abbey Road Studios in July 1963. Also included is the mono version of her breakout #1 smash hit single from January 1964, ‘Anyone Who Had A Heart’, which complements Cilla’s other smash hit #1 single from 1964, ‘You’re My World’, which is also featured as a bonus track in an interesting rare ‘Alternate Take’. The second disc contains “IN MY LIFE”, which was Cilla’s first album not to be produced by Sir George Martin. This new chapter in her recording career was headed up by producer David Mackay who’d had recent success with both Cliff Richard and The New Seekers. Mackay led Cilla in a new soft-rock In their initial sessions, Cilla recorded the album’s lead single ‘Baby We Can’t Go Wrong’ which became the opening theme for the 7th series of her BBC TV variety show Cilla and a Top 40 hit! Cilla, with husband and manager Bobby Willis and producer David Mackay, selected a diverse body of songs for ‘In My Life’ that included many hits of the day such as Paul Anka’s ‘Flashback’, Bread’s ‘Everything I Own’, The Hollies’ ‘The Air That I Breathe’, Jim Croce’s ‘I’ll Have To Say I Love You In A Song’ and The Beatles’ ‘In My Life’ which deservedly became the title song of the album. This re-release features many of Cilla’s rare and much sought after singles of the seventies as bonus tracks as well as Cilla’s tender rendition of ‘I’ll Still Love You (When Every Song Is Sung)’ which was penned by her friend George Harrison.